Enough of that! The lack of posts is simply that we had a friend staying and a BBQ and beer won over working on the blog. Sorry… Well, not very sorry. The mag team have been working southwards across the “Fosse field”, the proper name for which is Mobbs Hole. 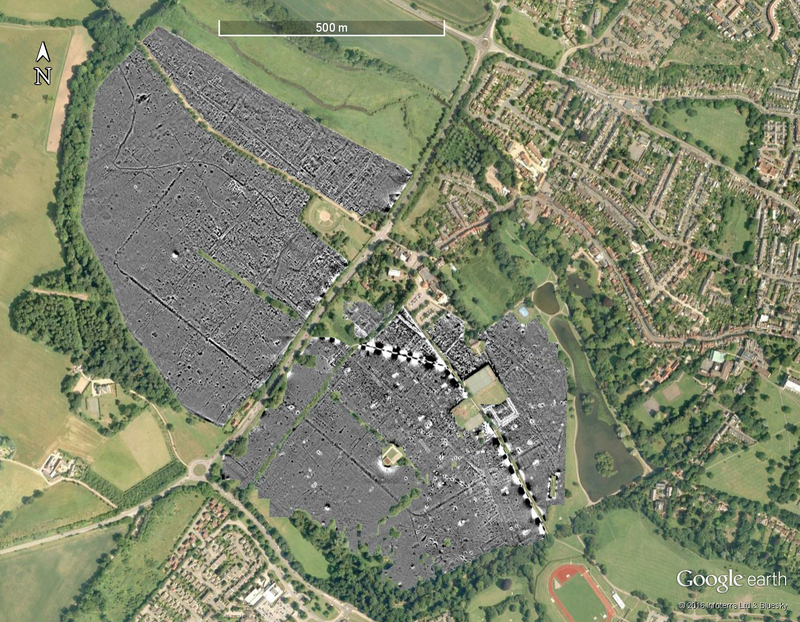 The area we have covered in around Verulamium is getting pretty large (Fig. 1)! 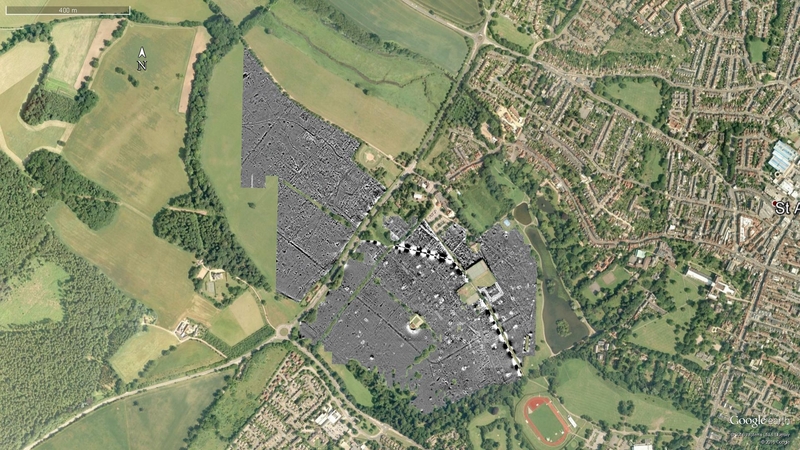 Figure 1: total area surveyed to date. The survey has now started to clip the edge of the Fosse itself. 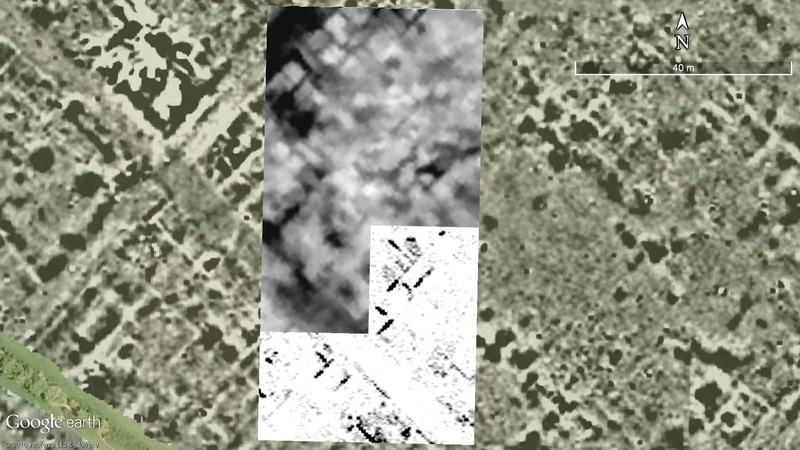 In Figure 2 I have used the 2006 imagery in which one can see the Fosse clearly as a soil mark. 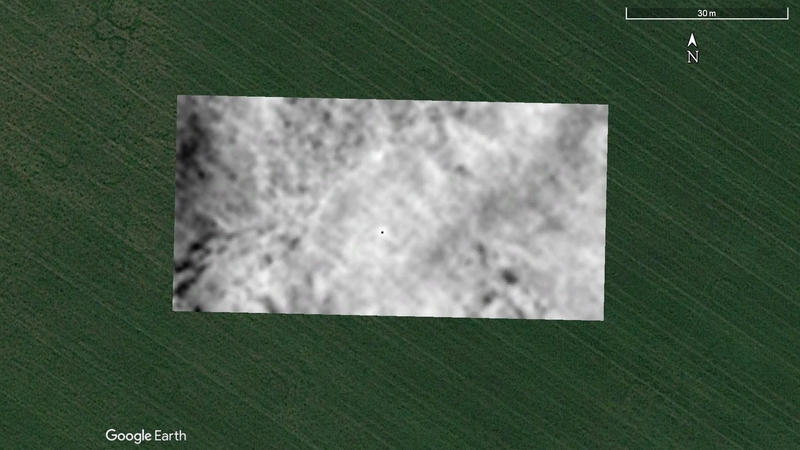 Figure 2: the mag data on the 2006 imagery in Google Earth. Progress is excellent for four and a half days of survey. 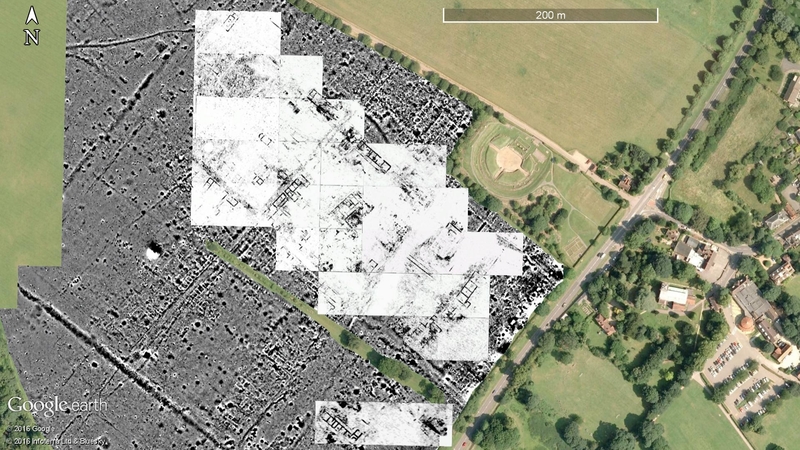 Figure 3 shows the survey in more detail. Figure 3: the mag data after day 5. The edges of the Fosse can be seen in the mag data, mainly as a lighter line. This is because the topsoil will be thinner over the lip of the ditch as soil has eroded down into the fill. There is a line of large dark “blobs” along the lip of the Fosse. Although these might be something interesting, I suspect they are tree-throws (i.e., the hole made by a tree being blown over). The field system which shows in the upper half of the survey is interesting. Jon Mein has kindly shown me the 1799 map of the parish and these boundaries do not match those mapped then. There is a line of woodland following the line of the Fosse a little to the south of the area we have reached. 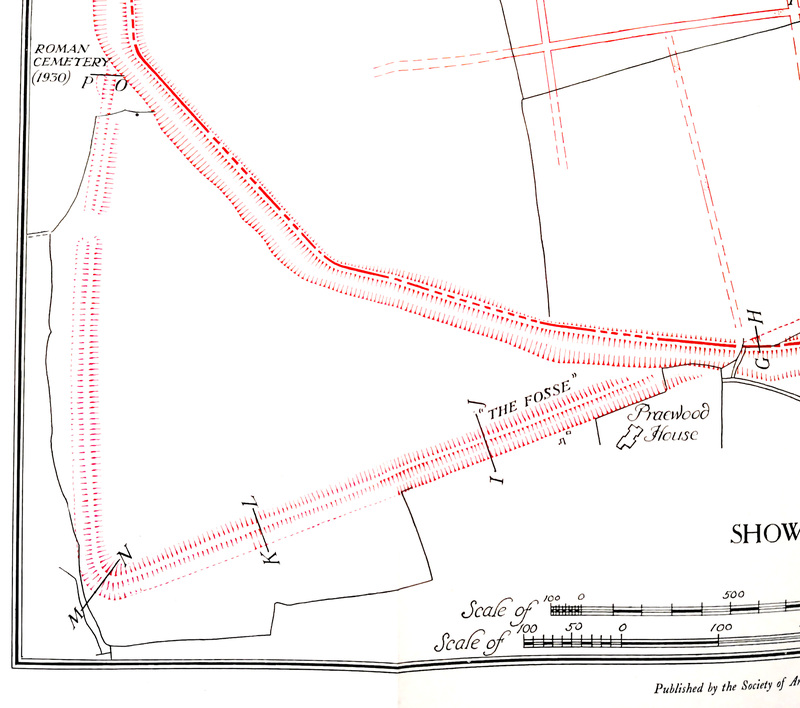 The track which runs along the northern edge of Mobbs Hole was a much more important road at that date. 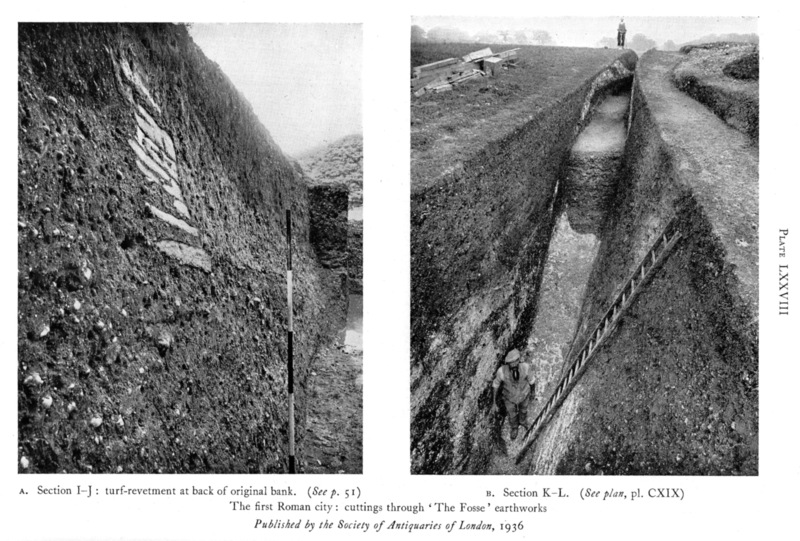 Wheeler thought that the Fosse represented the “first Roman city” at Verulamium and cut several sections across it (Figures 4, 5 and 6). 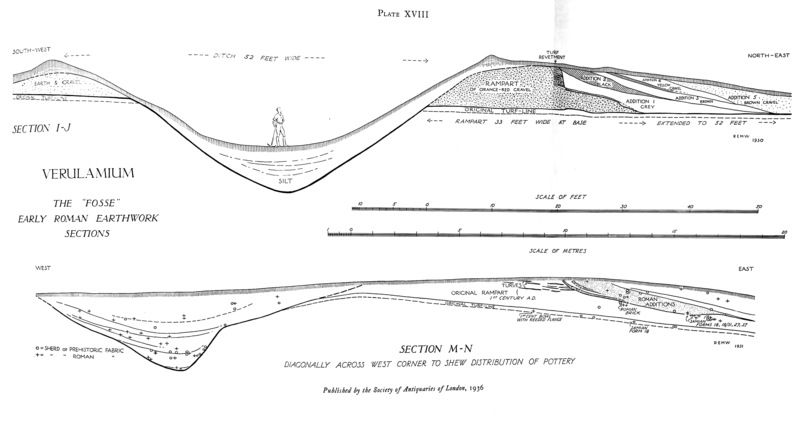 Figure 4: Wheeler and Wheeler 1936, plate 109, detail showing the location of the sections excavated by the Wheelers. Figure 5: Wheeler and Wheeler 1936, plate 18. Sections across the Fosse. Figure 6: Wheeler and Wheeler 1936, plate 78. Sections across the Fosse. We now know that the early Roman town was based down towards the forum where the Museum now is. The Fosse, however, does appear from Wheeler’s finds to be first century. But what was it for? Hopefully, the geophysics within the line of the Fosse may give us a clue. 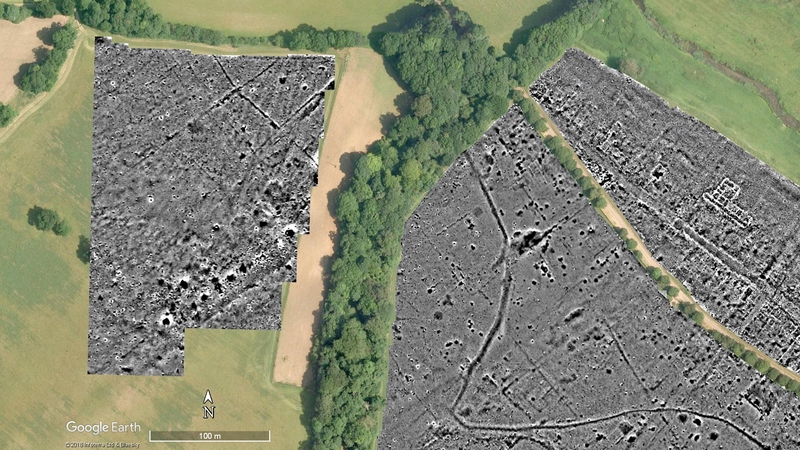 One aspect of the landscape I had not appreciated was that the dry valley which the aqueduct has to dog-leg across as shown in our survey (the V-shaped long linear feature within the town walls shown in Figure 2), becomes quite a major feature to the west of the walls. The northern arm of the Fosse lies on the crest between the dry valley and the valley of the Ver, and then when it turns to form the southern arm it has to cross that valley. Figures 7 and 8 compares the plate published by the Wheelers showing the view from the crest to a panorama I took the other day. 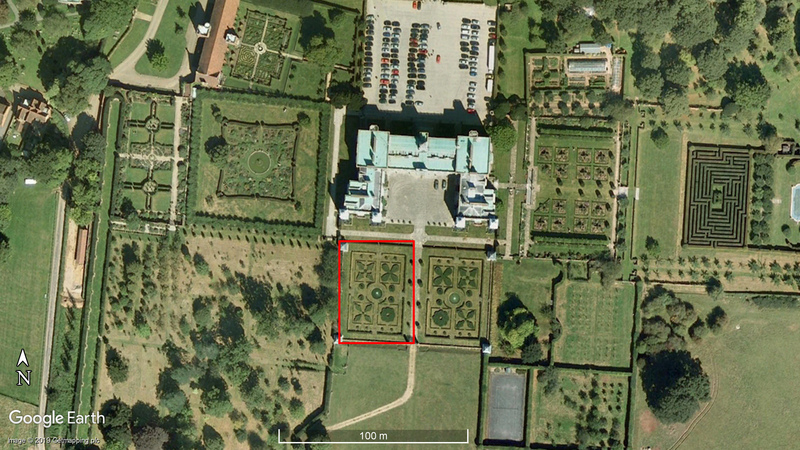 The hedge line shown in the Wheelers’ plate is no longer there. 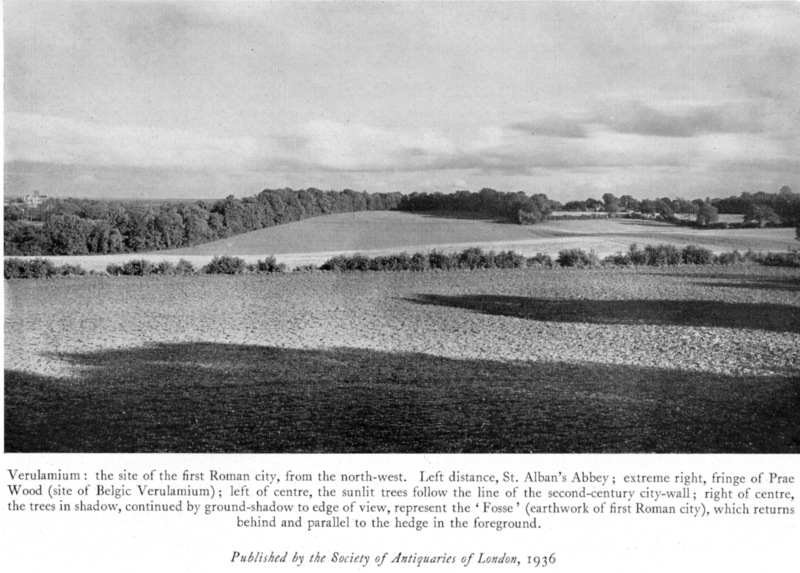 Figure 7: view southward across the Fosse as published by the Wheelers in 1936. Figure 8: Panorama of Mobbs Hole (click to see full sized). Back inside the town walls the GPR crew completed an awkward couple of blocks on “sawtooth” Saturday and another 80 x 40m block on Sunday. Figures 9 and 10 show some of the time slices. 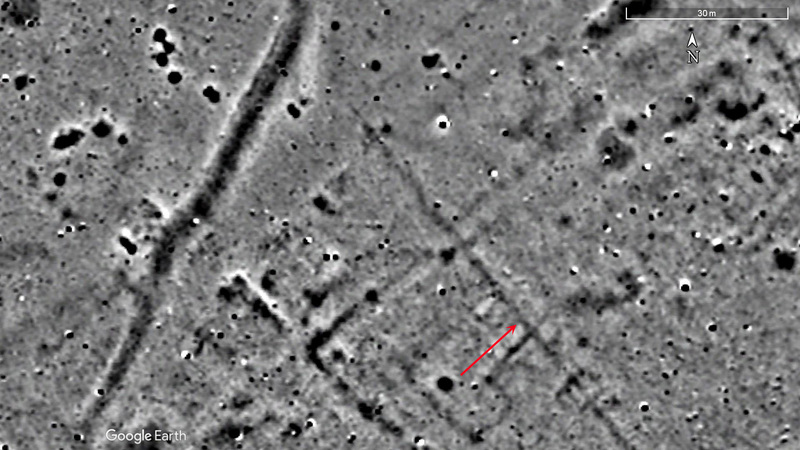 Figure 9: the GPR from day 4. 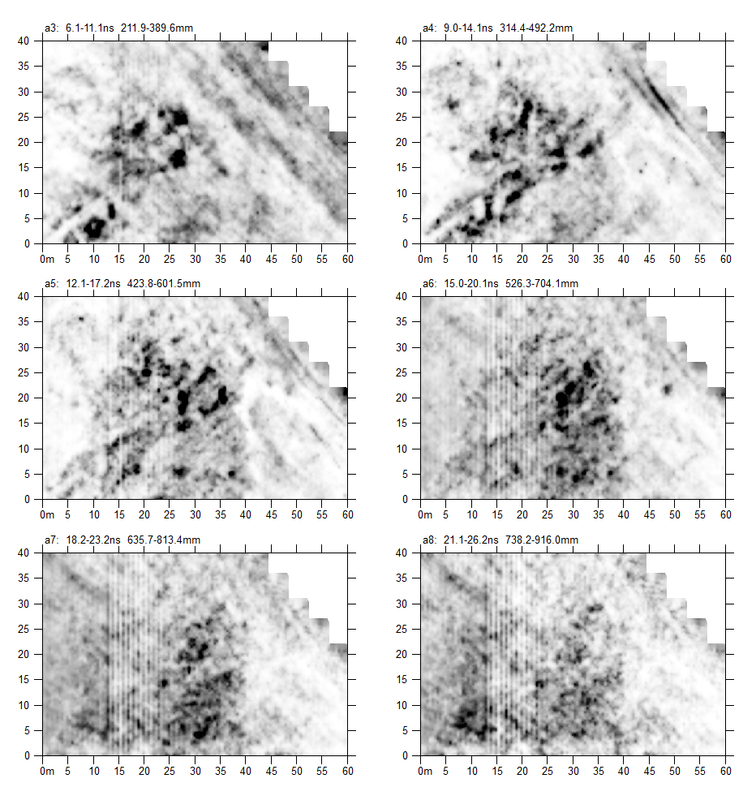 Figure 10: GPR time slices from day 5. On neither day do we have some of the beautifully clear buildings we have seen previously. 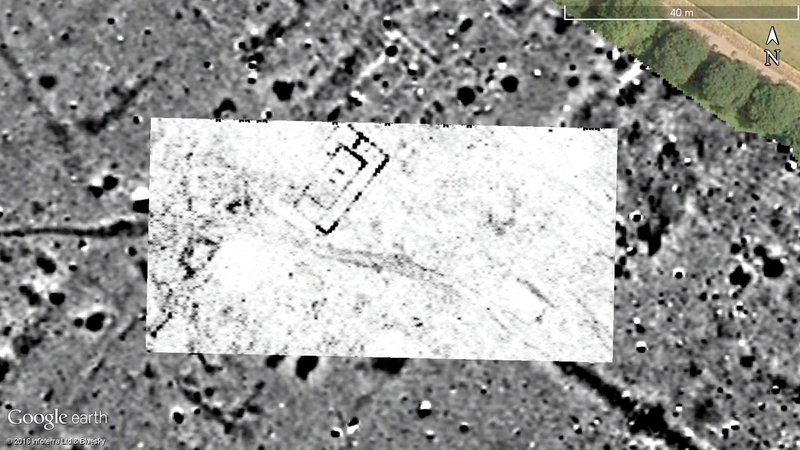 There does seem to be a small square structure showing on day 5: the NW edges showing in slice 8 (the sixth image in Figure 10) and the bottom edge in slice 10. 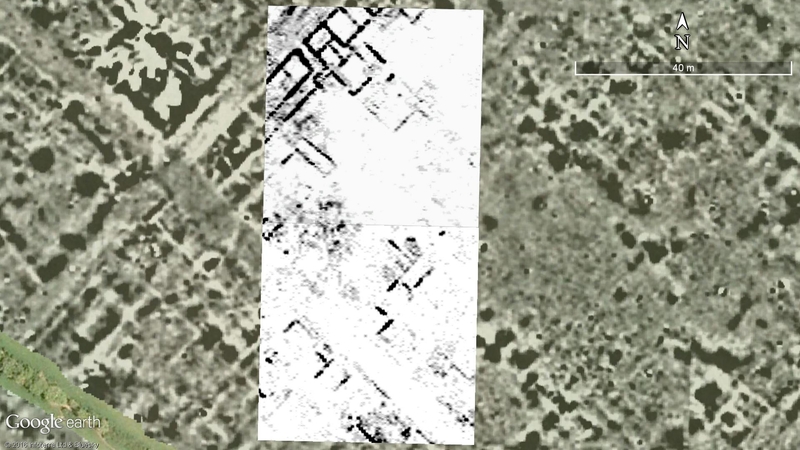 Figures 11 and 12 show slices 5 and 6 from days 2 to 5 in Google Earth. Figure 11: GPR days 2 to 5, slice 5. Figure 12: GPR days 2 to 5, slice 6. 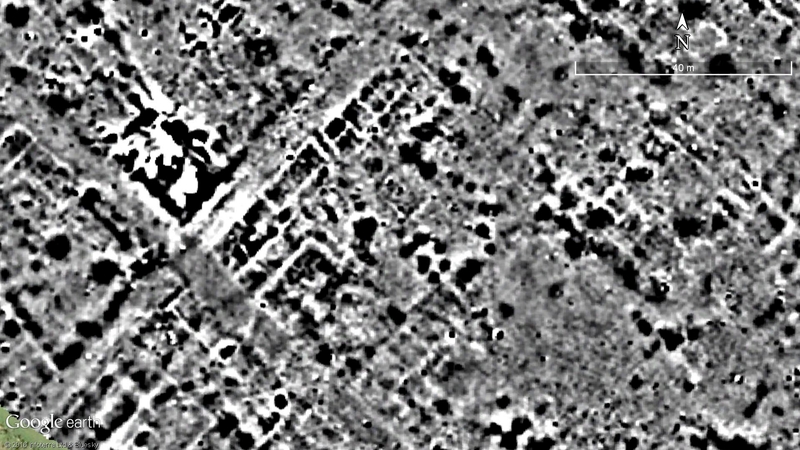 Although we have not got lovely clear buildings, the “blobby” bits do have a generally SW — NE orientation which matches the town grid. It is, however, very difficult to interpret. Looking carefully, however, there is more than immediately catches the eye. Lets look at the day 5 data more closely. 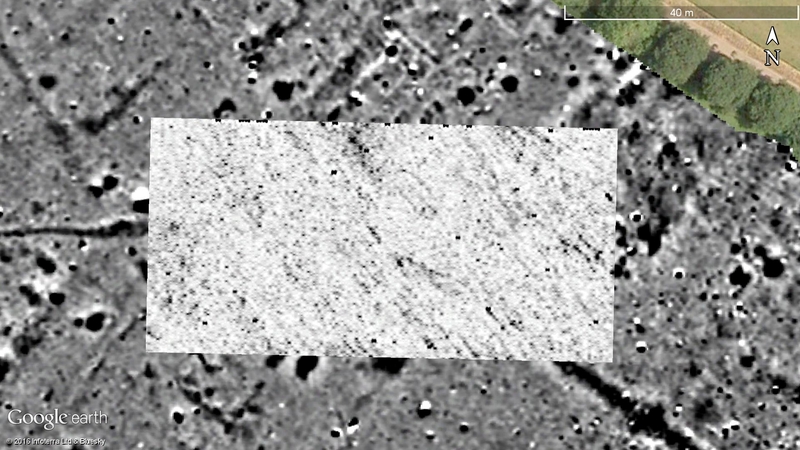 Figure 13: GPR day 5, slice 6. It all seems rather dull. Now plot that on top of the mag data. Look at the point the red arrow is indicating in Figure 14. Figure 15 just shows the mag data. 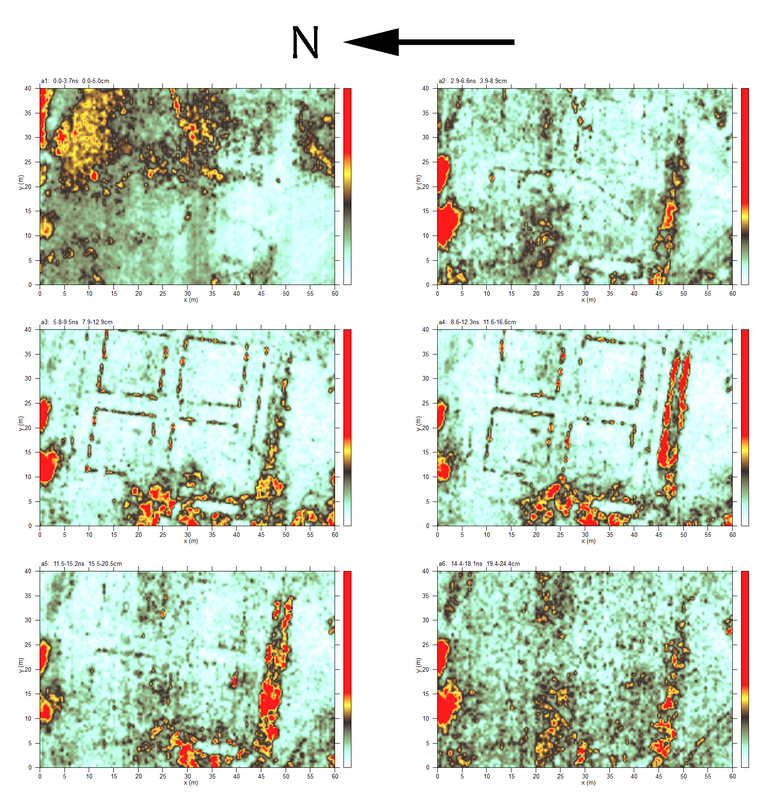 Figure 14: Day 5 GPR overlain on the mag data. 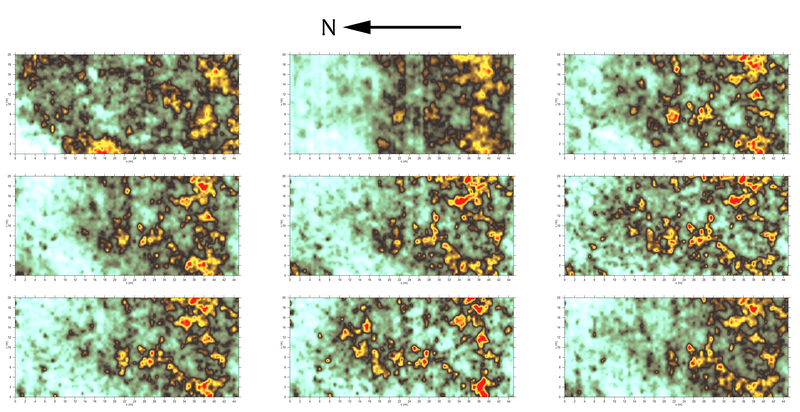 Figure 15: the mag data from the same area as Figure 14. 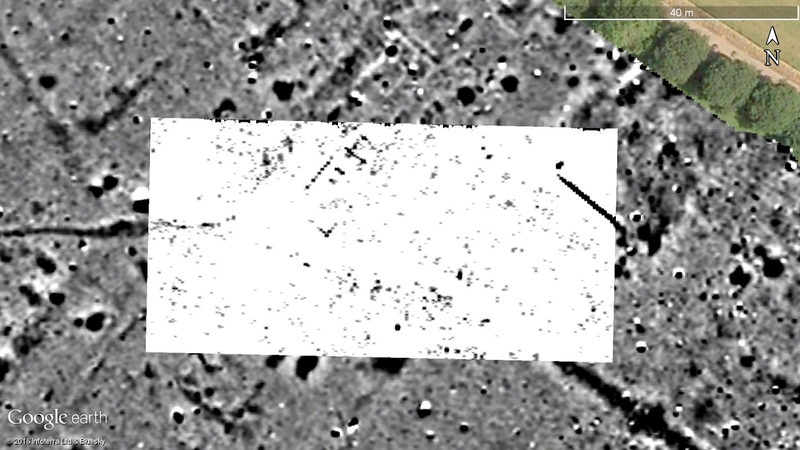 The feature which shows quite clearly in the mag data does show quite faintly in the GPR. The moral: lovely clear buildings are wonderful, but sometimes there is more there than you think. Many thanks to everyone involved. 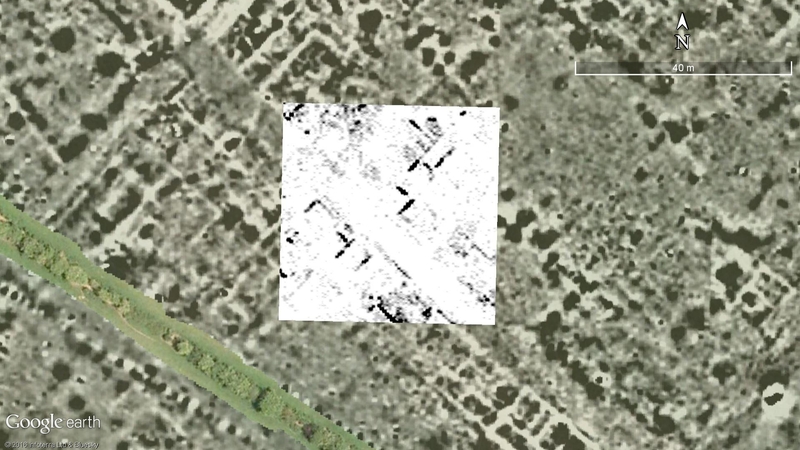 The heat has made it quite hard work, but the survey looks ever more amazing with each new grid square! 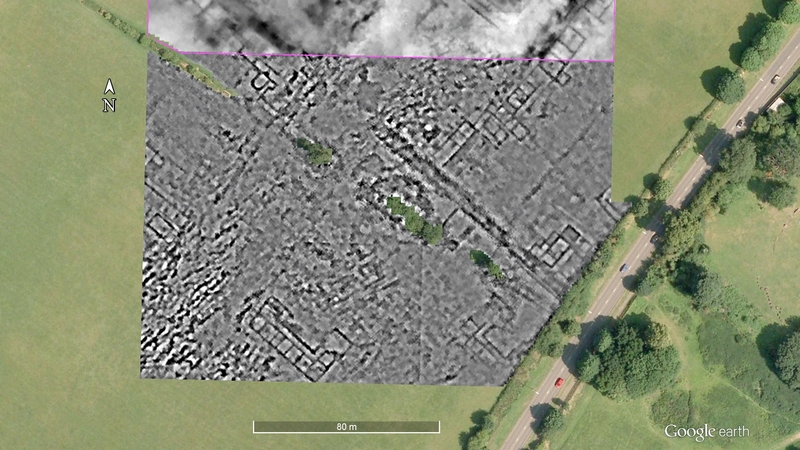 This entry was posted in Verulamium and tagged ahrc, archaeology, CAGG, GPR, Ground Penetrating Radar, magnetometry, Roman, Roman town, Roman urbanism, survey, timelapse, ucl, urbanism, Verulamium, WAS on August 7, 2018 by hertsgeosurvey. A group of us headed out to Little Hadham today with the aim of extending both the Earth Resistance and magnetometry surveys. By the time Nigel had pushed the mag across the field, the wheels had diameters several inches larger than they should. Jim tried a line or two of data collection, but the odometer was over-running by two meters and the wheel needed trowelling clean every transect. We decided, therefore, to abandon the mag survey, and concentrate on enlarging the area of the Earth Resistance survey. We managed another six 20x20m squares giving us a total of 100m by 80m, some 32,000 readings in total. Figure 1, below, shows the initial results. As before, the data is dominated by striping caused by the cultivation pattern. 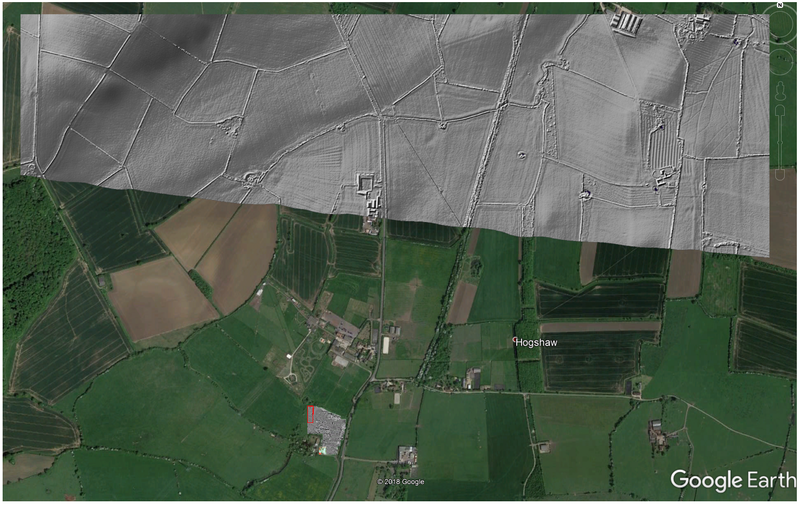 A 2D fast fourier transform (as implemented in TerraSurveyor), quickly removed these stripes. Fig. 1: the Earth Resistance data overlain on the mag data. In Figure 2 I have applied the filter to remove the striping. To the right I have put the mag data for comparison. Fig. 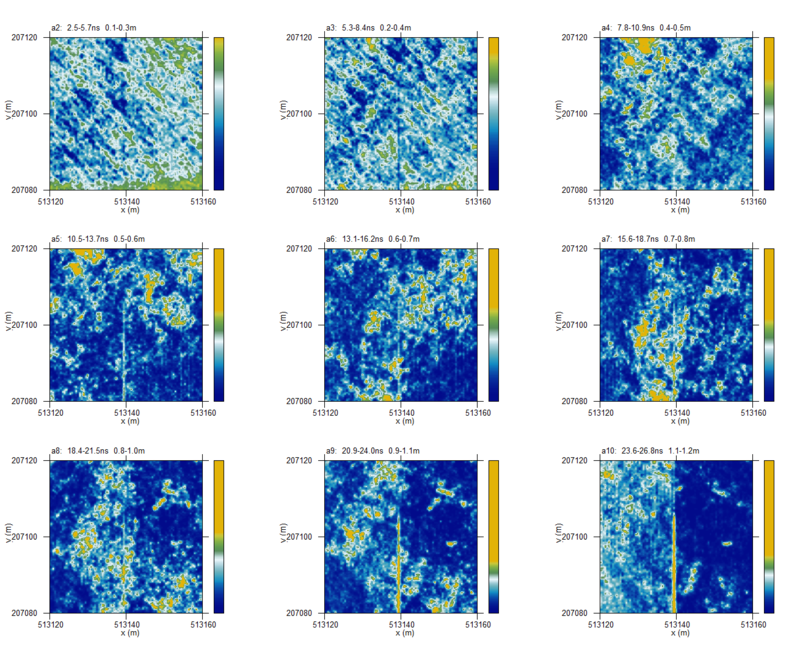 2: The resistance data after processing with the 2DFFT. 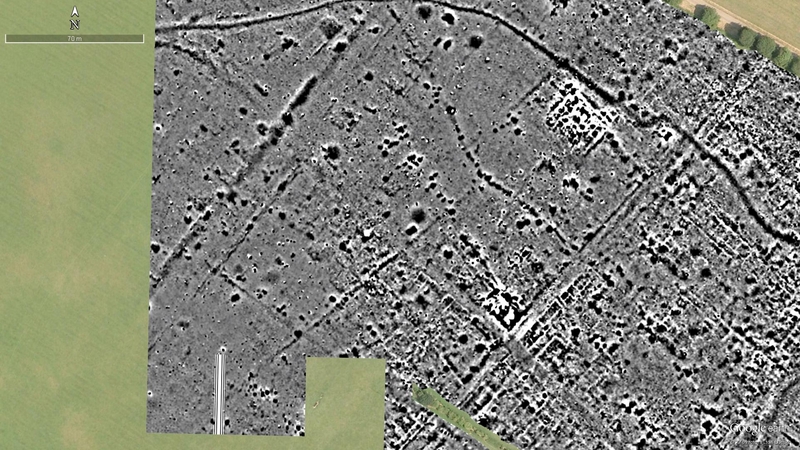 The mag data of the same area is shown to the right. Unusually, most of the features show in the res and mag data. 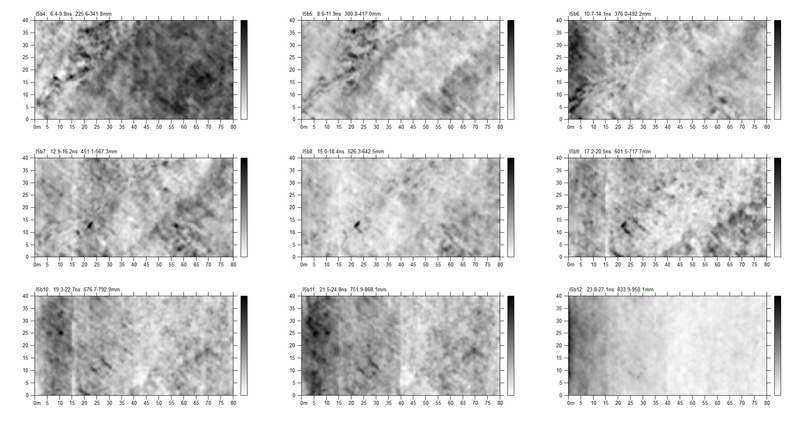 The res data has nicely picked-up many of the linear features more normally only clearly seen in mag data. In Figure 3 I have labelled a few points. Fig. 3: the res and mag data with labels. Ditch features A and B show nicely in both the res and mag data. What is clear from the res data, however, is that the ditch continues between the two and they are one distinct linear feature. If one draws a straight line along A and B, it lines up perfectly with the linear feature C we found across the road in 2014. Linear feature D shows equally well in both data sets. At E, something complex is happening. In the mag data it looks almost as if A is turning and runs alongside E, whereas in the res data is looks more like AB cuts across the linear to the west of E. The parallel lines to the west of E show quite well in both, and are probably some form of trackway. Many thanks to Jim (CVAHS; both for surveying and transporting the equipment and myself), Nigel (NHAS), Caroline, Peter, Amanda and Mark (BAG). Hopefully we can get to do some more when the field is less claggy. 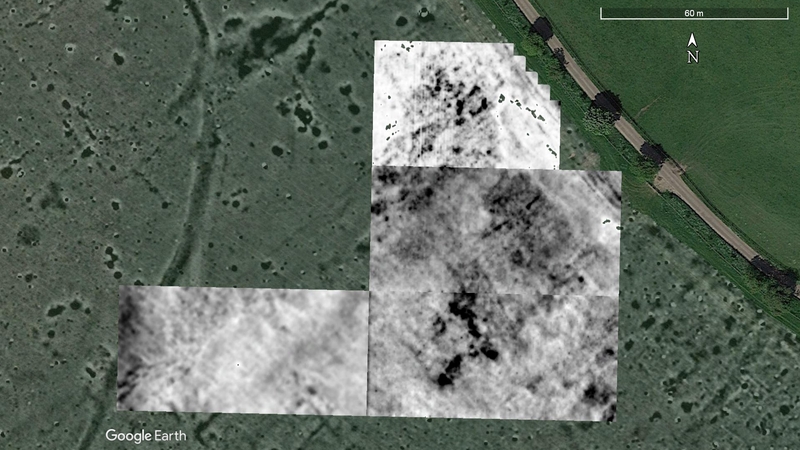 This entry was posted in Little Hadham and tagged archaeology, BAG, Braughing Archaeological Group, CAGG, claggy, earth resistance survey, geophysical survey, geophysics, Geoscan RM85, Hertfordshire, Institute of Archaeology, Little Hadham, ucl on December 3, 2017 by hertsgeosurvey. Everyone worked extremely hard today. Mike and Jim on the GPR finished yesterday’s block and managed another 40x40m grid square. No easy task over the long grass and thistles. 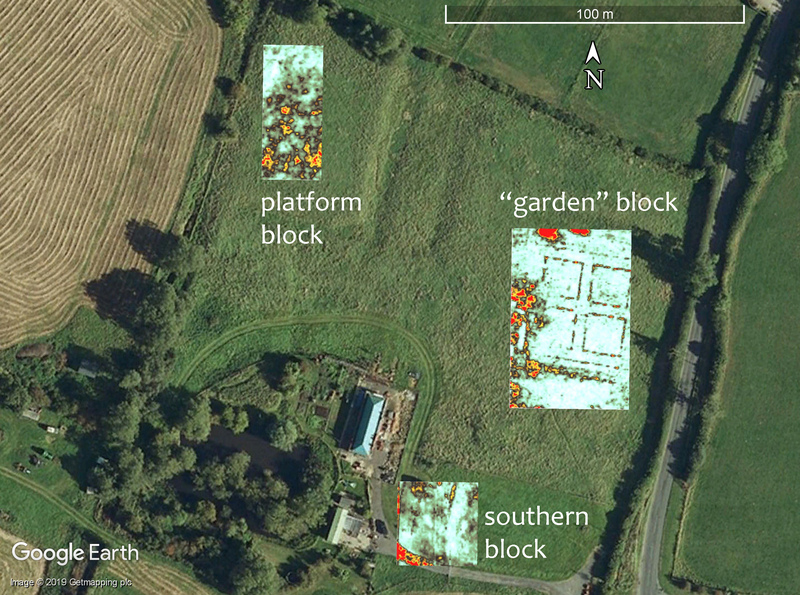 Ruth, Dave and Julia completed five earth resistance squares, including two that had to be done in two parts and joined together in the software later due to an inconvenient hedge! Good job everybody, and many thanks. 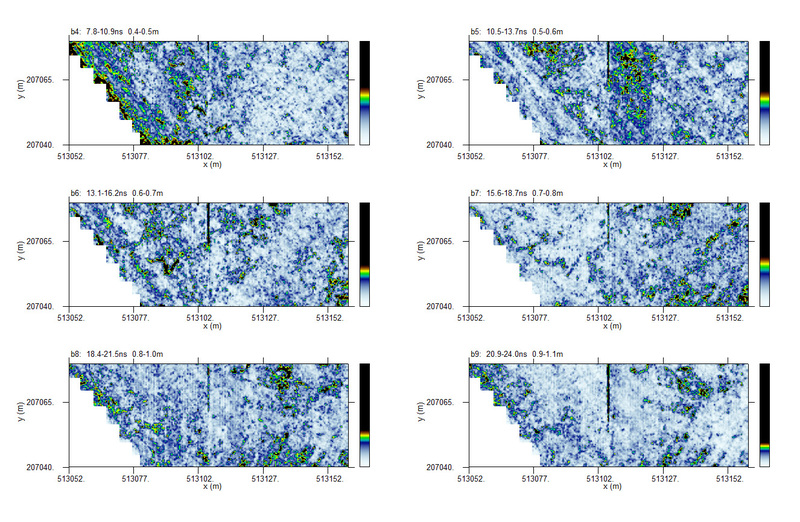 Here is the Earth Resistance survey, both normal, high-pass filtered, and the magnetometry data from the same area. Fig. 1: the Earth Resistance data at the end of day 16. Fig. 2: the Earth Resistance data at the end of day 16, high pass filtered. Fig. 3: the magnetometry data for the area shown in Figs. 1 and 2. 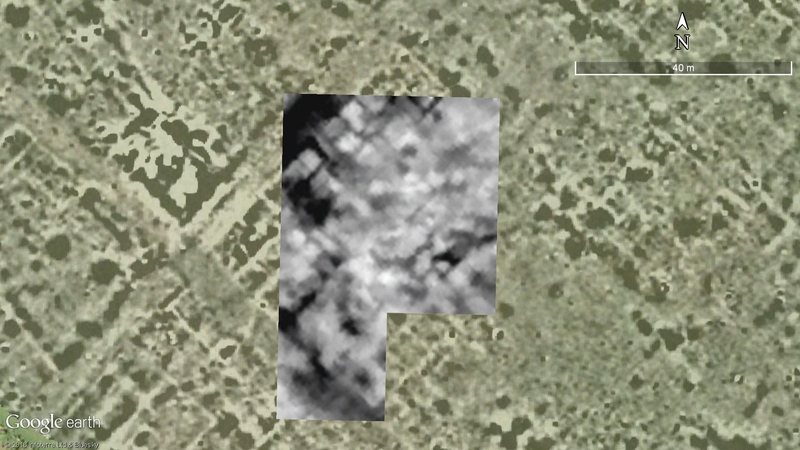 I hate to say it, but our five squares, including the two annoying partials, appear to lie between the buildings along the road to the north of the hedge line, and to the north of the buildings we found yesterday. We do, however, have a nice tidy area surveyed now. We couldn’t have left quite such a silly hole in our survey data. Tomorrow we head north to survey along the northern edge of the block we did last year. Fig. 4: the GPR time slices from the block completed on day 16. Nothing very exciting jumps out from the plots, although there are some things to check out. Slice 6 (second from top on left) has a strange upside-down M shaped feature (in black) and slice 8 (bottom-left) has something semi- or sub-circular near the northern edge. How about the second block? Fig. 5: the GPR time slices from the second block completed on Day 16. Not a great deal there either. Sorry guys! 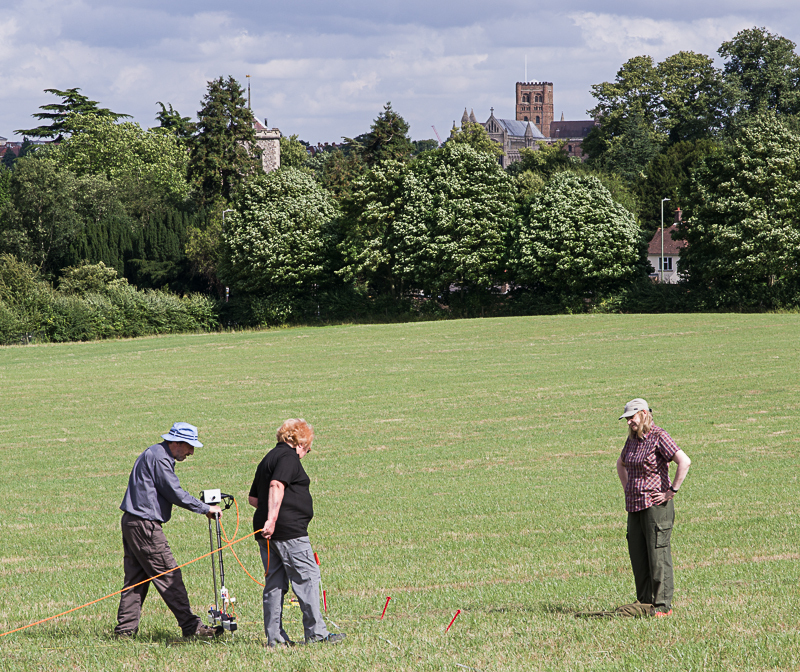 Tomorrow sees the GPR crew filling-in an odd gap between last year’s survey and this years. The plus side is that the mag shows lots of buildings, so tomorrow’s results ought to be much more interesting! Many thanks to everyone who worked so hard in the sun today. Just two more days. 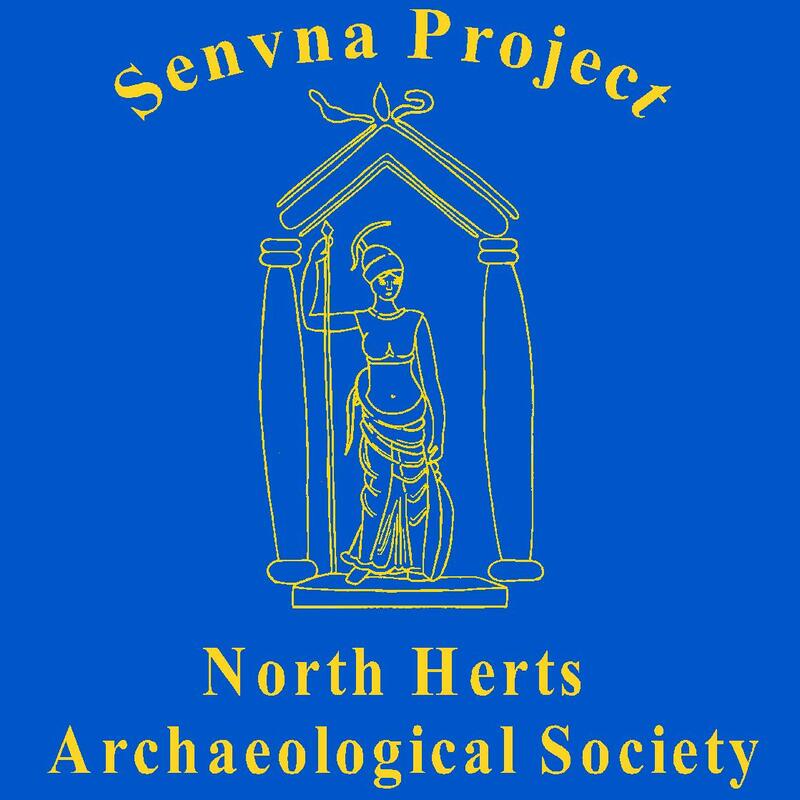 This entry was posted in Uncategorized and tagged ahrc, archaeology, CAGG, community archaeology, earth resistance survey, geophysical survey, geophysics, Geoscan RM85, Gorhambury, GPR, Mala, Roman, Roman town, Roman urbanism, SEAHA, ucl, Verulamium on August 25, 2017 by hertsgeosurvey. Today saw a slightly smaller team than we have had, but we still managed a good area of magnetometry survey and GPR, and even one small square of Earth Resistance survey. First, the mag survey. 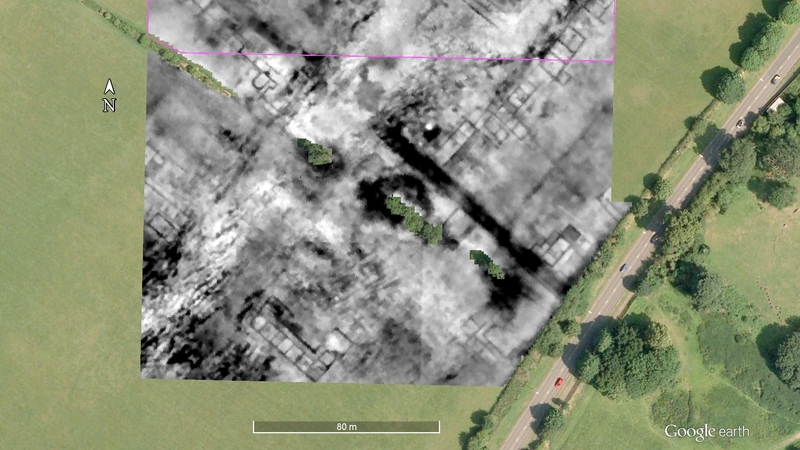 The team are starting to work their way north along the western edge of our survey area filling in between what we have already surveyed and the third century town wall which is hidden in the trees in the Google Earth image. The magnetometry survey up to the end of day 24. 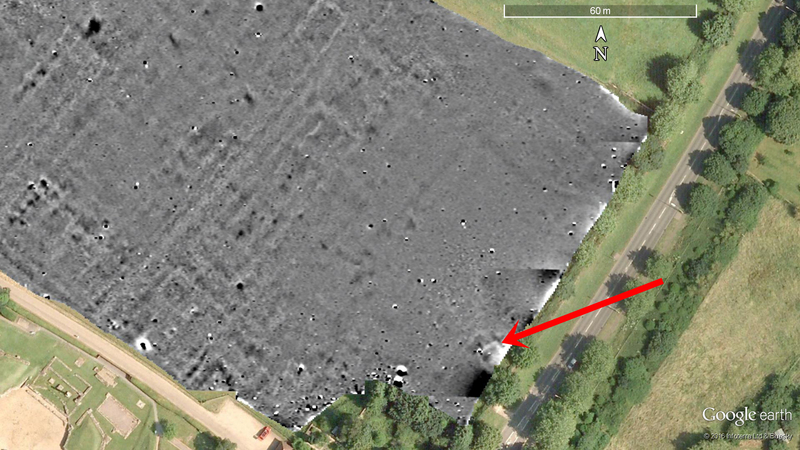 Looking at the area surveyed today in more detail, we can see the beginnings of the corner of the “1955 ditch”. The area surveyed on day 24. There is surprisingly little of anything much showing inside or outside the ditch in this corner. The ditch is, however, slightly narrowing and bowing. How curious! Tomorrow should, fingers crossed, see us pick up the rest of the corner. The GPR team, way down the hill near the drive, completed another 40x80m block. Here are four 3ns thick time-slices. Day 24 GPR, time slice 2 (9.5 to 12.5ns). Day 24 GPR, time slice 3 (12.5 to 15.5ns). Day 24 GPR, time slice 4 (15.5 to 18.5ns). Day 24 GPR, time slice 5 (18.5 to 21.5ns). 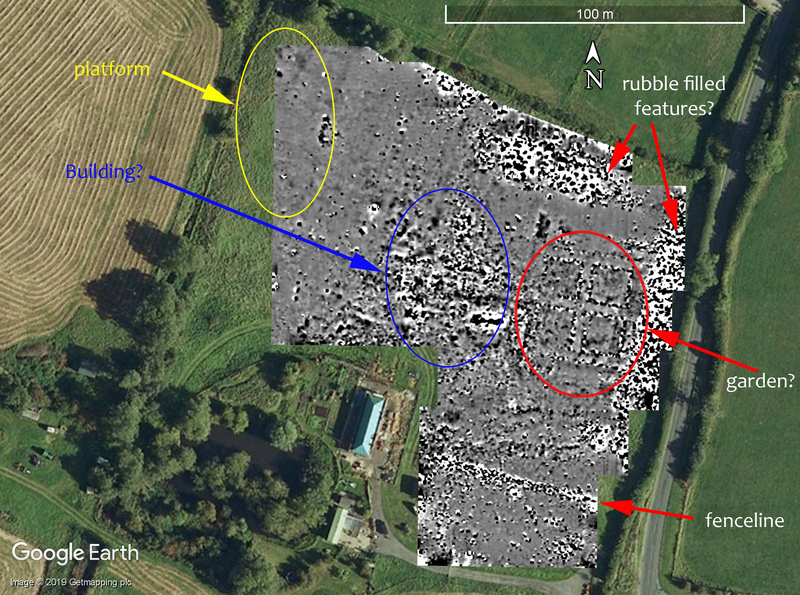 The top image (time slice 2) just shows the noise in the ploughsoil. 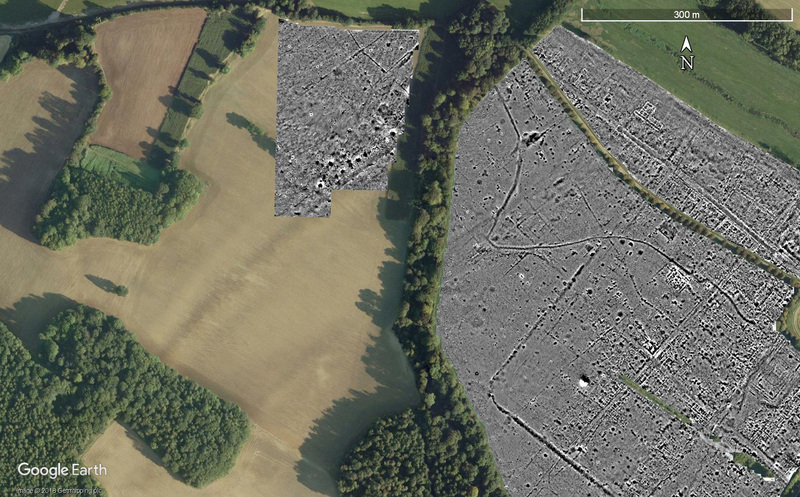 The second image, however, shows a lovely little building 16.5m by 10m in size, aligned with the “1955 ditch”. I’m not certain what this building is, it seems an unusual plan for a domestic structure. The third image (time slice 4) shows this building, but also a very strong reflection from a wall on the eastern side. Presumably this is part of a building which has been robbed out more thoroughly. In the last time slice the signal has “attenuated” and we are only getting the strongest reflections showing. The overall image gives some idea of how much we have now covered. 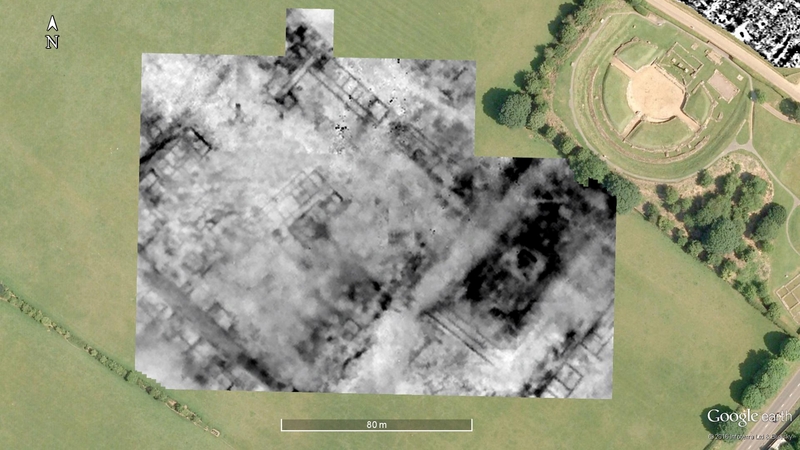 The area covered by the GPR at the end of day 24. 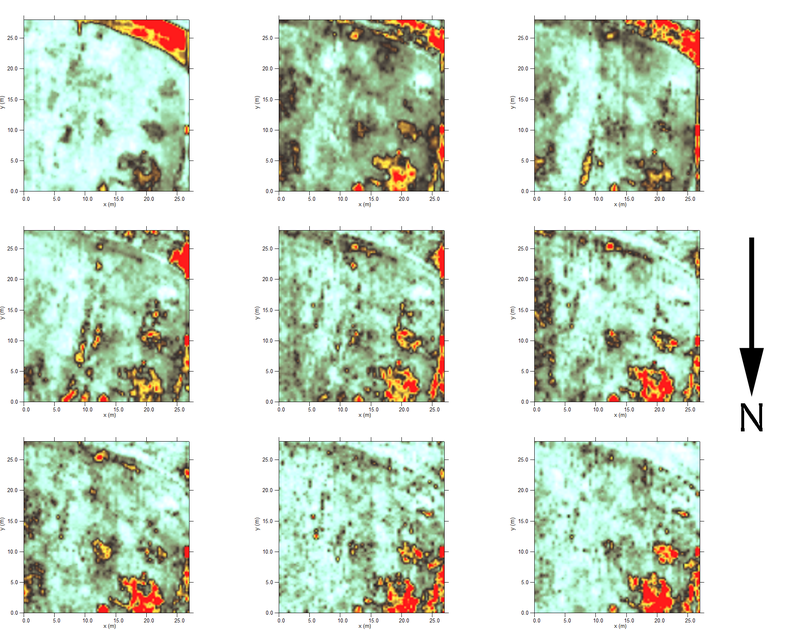 This image is a bit of a mismatched mishmash as the data was collected at different times and the time slices are somewhat variable as I have learnt to process the data over the last year. At some point all the data will need to be reworked systematically, but that is beyond me while we are out collecting yet more data every day! Many thanks to everyone who helped, and welcome to the people who have recently joined the team. Your efforts are producing spectacular results. 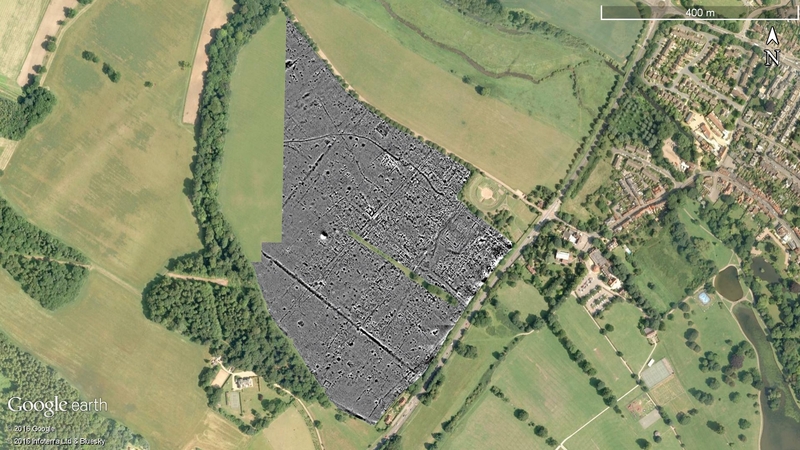 This entry was posted in Verulamium and tagged archaeology, CAGG, geophysical survey, GPR, Ground Penetrating Radar, Hertfordshire, magnetometry survey, Roman town, Verulamium on August 10, 2016 by hertsgeosurvey. When I woke at about 6am I could hear the pitter-pat of rain outside the window. I groaned. Today was to see the start of the second season of work at Gorhambury. Rain! Just what we didn’t need. I shouldn’t have worried as the rain soon stopped, and by midday the sun was out and the weather was warm. My other worry was that a week ago we had no equipment. The mag was being repaired, the GPR was somewhere in Oxford and the Institute of Archaeology’s nice new RM85 Resistance meter had yet to be delivered. 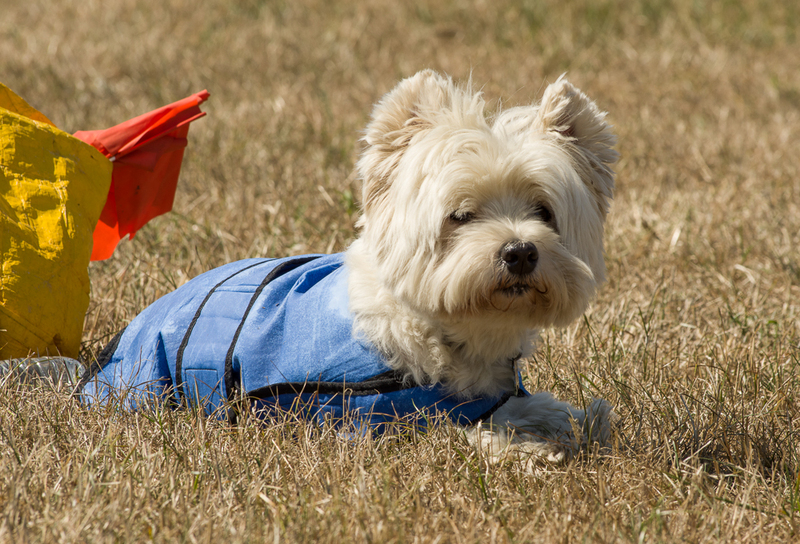 On Sunday we tested the mag… all seemed well. Yesterday Ellen drove to Oxford to collect the GPR (she’s a star! ), and UPS delivered the res kit. Yay. All ready to go. 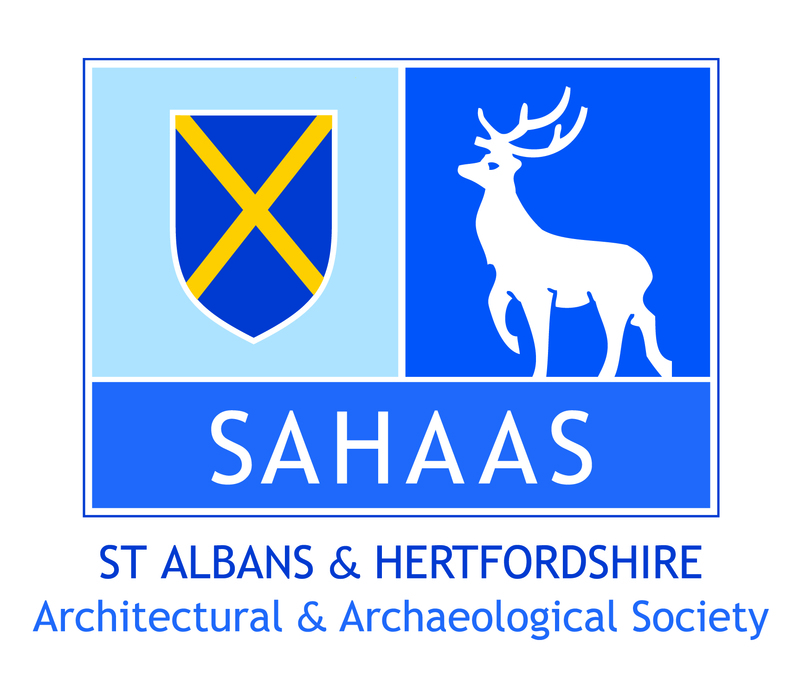 We had a large team today consisting of a mixture of regular members and some new faces, mainly from the St Albans and Hertfordshire Architectural and Archaeological Society. It was excellent to have such a large team allowing us to run all three instruments. Many thanks to everyone who helped. The new resistance meter has the ability to take two readings side-by-side, and does so very quickly. I was very impressed with the first day we used it. We managed five 20m x 20m squares at four readings per meter, even with a delay as we set it up. The new resistance meter in action with St Albans Abbey in the background. We also completed eight 40m x 40m mag grids and two GPR grids, one 40 x 40m and one with a ragged edge. 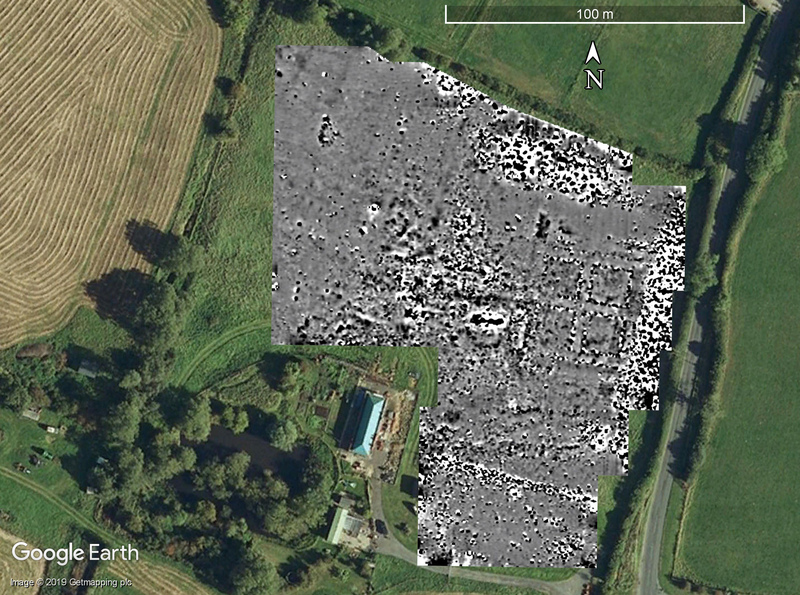 The next image shows the mag survey of the entire town so far. The town as surveyed so far. I’m starting to believe we might actually get the whole town, well the area available within the town, surveyed! 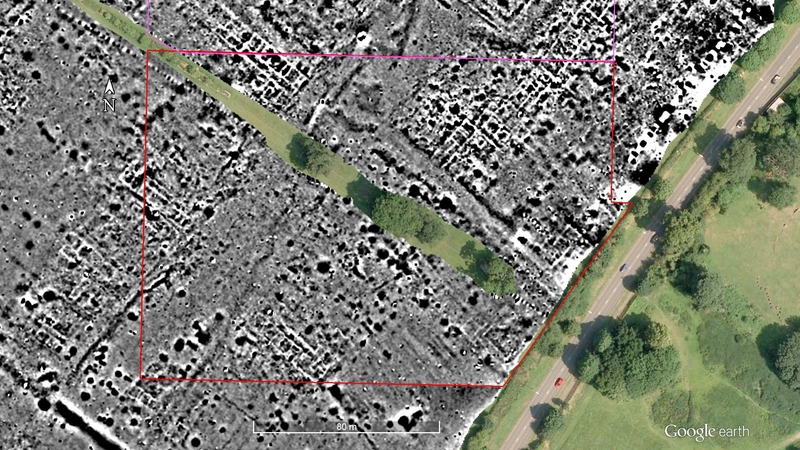 Zooming into the area we did today, we can see that we have picked up some more of the “1955 ditch”, the first-century boundary of the town first excavated by Frere in 1955. 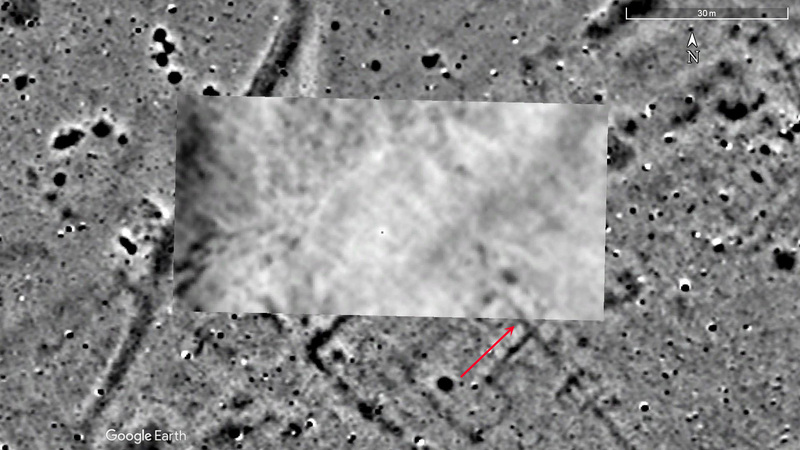 It is the wide, straight dark linear feature which runs diagonally from the SW to the NE in the image below. The area surveyed on day 19. The annoying sensor-freeze struck again in the penultimate square. 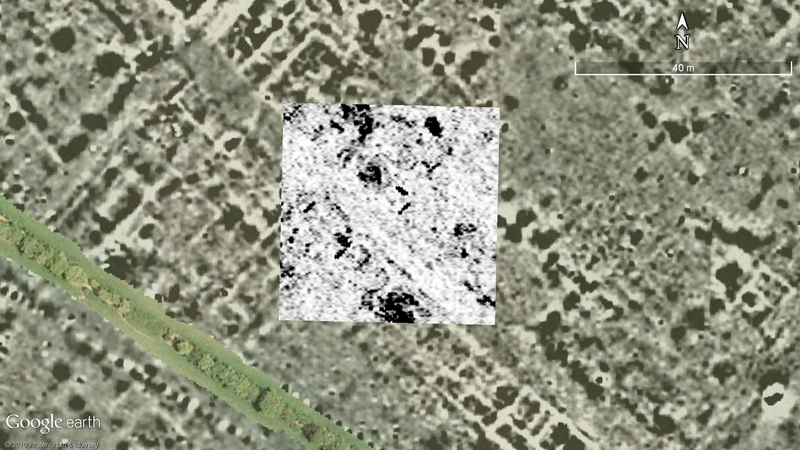 Luckily it was only one line (the funny stripes are a result of the data processing) and we can re-do just that tiny bit and merge the data into the square in the software. 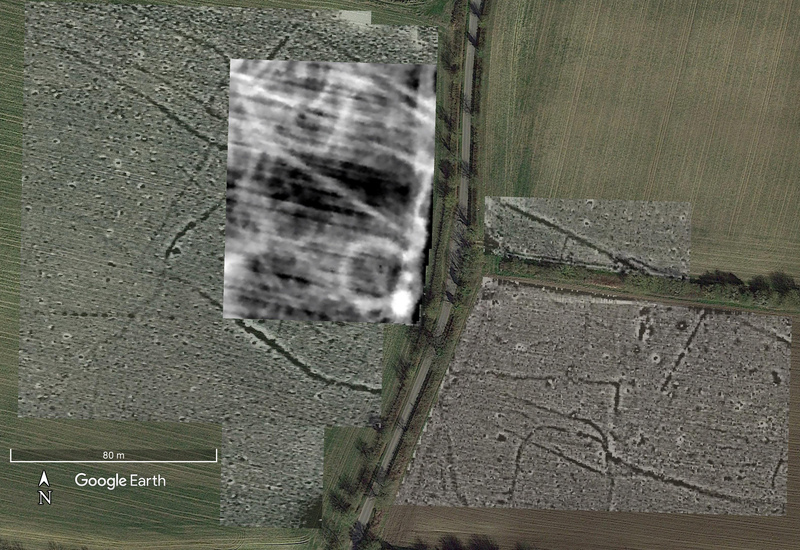 We mainly found ditches and pits (the dark blobs and lines), and are just getting to the busy area near the road. 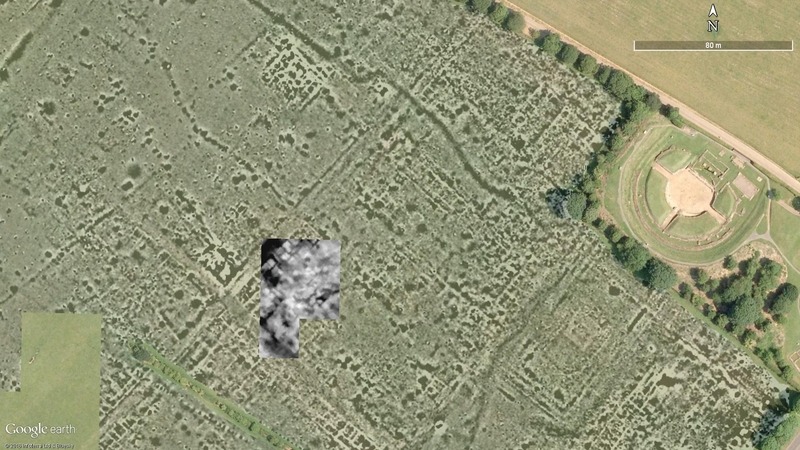 There is a faint suggestion of a road behind the 1955 ditch, as we found in the southern area. The resistance survey was a great success! We did an area to the WSW of the theatre. 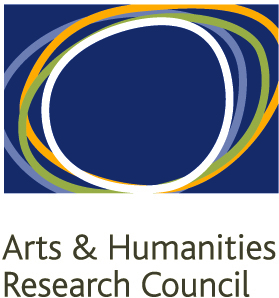 Location of the resistance survey. As I hoped, it picked up the road very clearly, but also picked up some of the details of the buildings. The next two images show the resistance data and the mag data for comparison. The mag survey for the same area as the previous image. 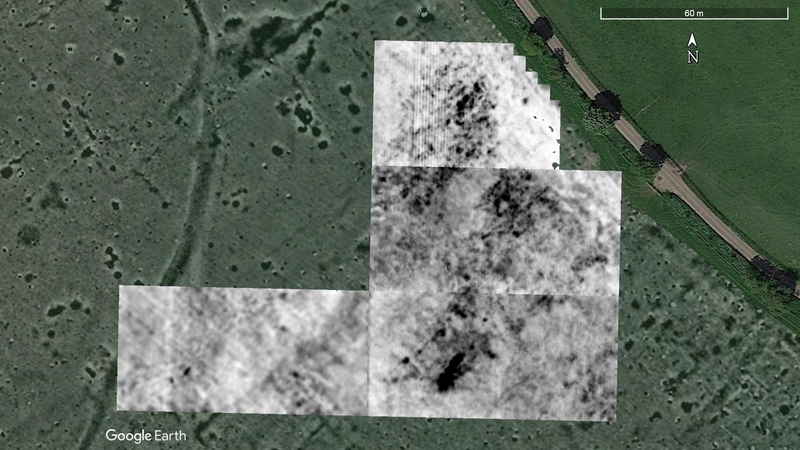 The GPR survey is just to the south of the res survey. I have only processed the north block as it is too late to process the jagged-edged one too. A number of walls and buildings are evident in the third and fourth time-slices. 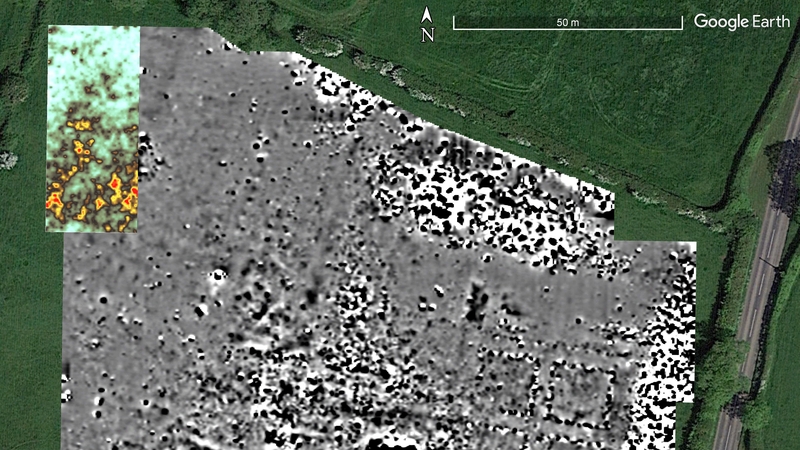 Day 19 GPR survey, north block, slice 3 (14 to 18 ns). 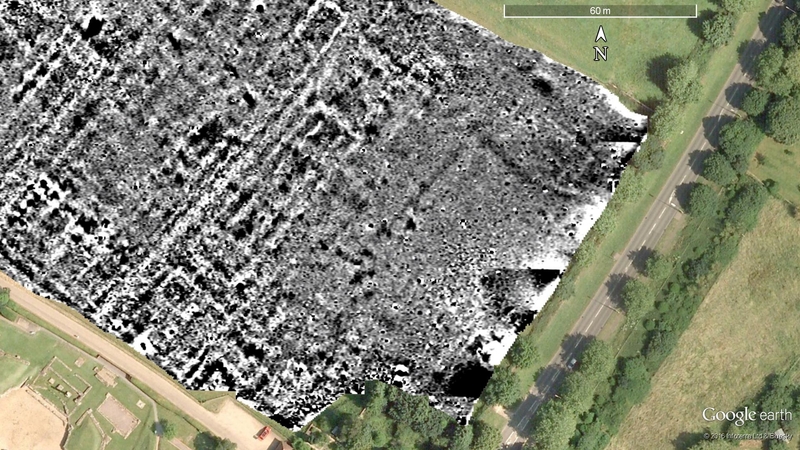 Day 19 GPR survey, north block, slice 4 (18 to 22 ns). The comparison with the resistance survey is also very interesting. 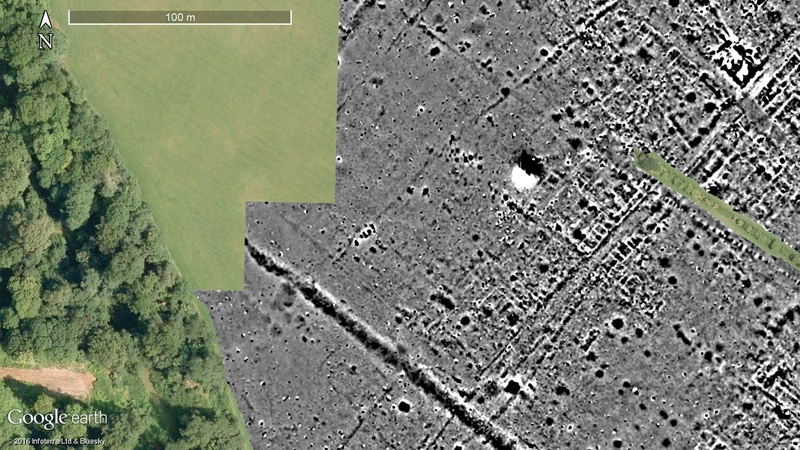 The GPR time-slices tend to show the walls better, but the resistance survey tends to show the road better. Resistance survey overlain on the GPR and mag surveys. 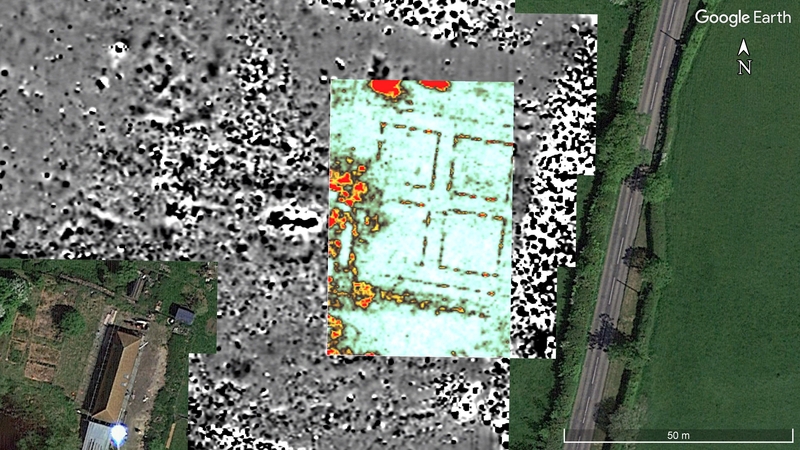 GPR data from the same grids as the res survey in the previous image. Short and sweet posting this evening as we have another busy day tomorrow, but at least this gives you a feel for what we are now finding. 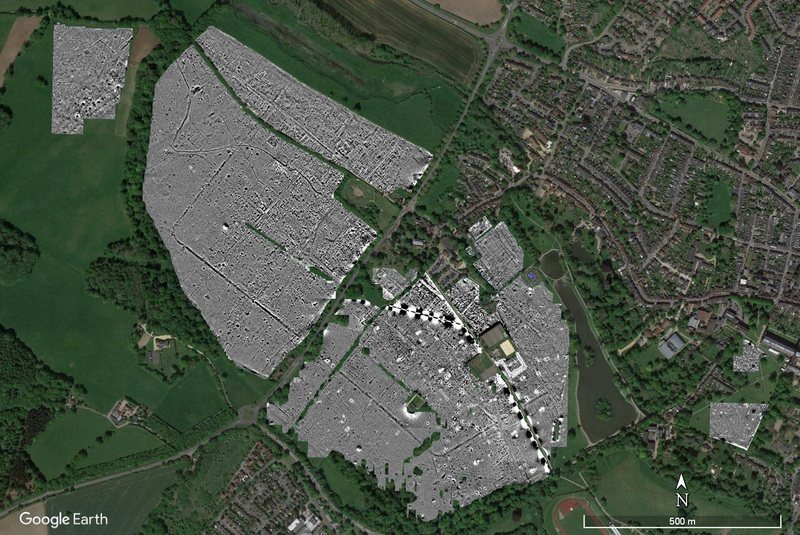 This entry was posted in Verulamium and tagged archaeology, earth resistance survey, Gorhambury, GPR, Ground Penetrating Radar, magnetometry, Roman, urban, Verulamium on August 3, 2016 by hertsgeosurvey.